The event’s economic impact is huge and makes it one of Spokane’s top three sports events in dollars spent. One study estimates its total benefit exceeds $40 million. Other studies place its benefit at less than $30 million. Like most major events, Hoopfest owes its silver-plated success to good luck, persistence and the good fortune of following a bona fide example – in its case, Bloomsday – say people who’ve nurtured Spokane’s 3-on-3 annual downtown hoops avalanche. Hoopfest’s two founders asked Terry Kelly for help to get the city’s first-ever basketball tournament off to a good start 24 years ago. Kelly, a Gonzaga Prep and Washington State University hoops star, had doubts. Spokane and North Idaho just didn’t have enough dedicated players and fans to make Hoopfest a success, he told them. Today, as the 25th Hoopfest draws the year’s largest crowds to Spokane, Kelly is glad to admit he was wrong. 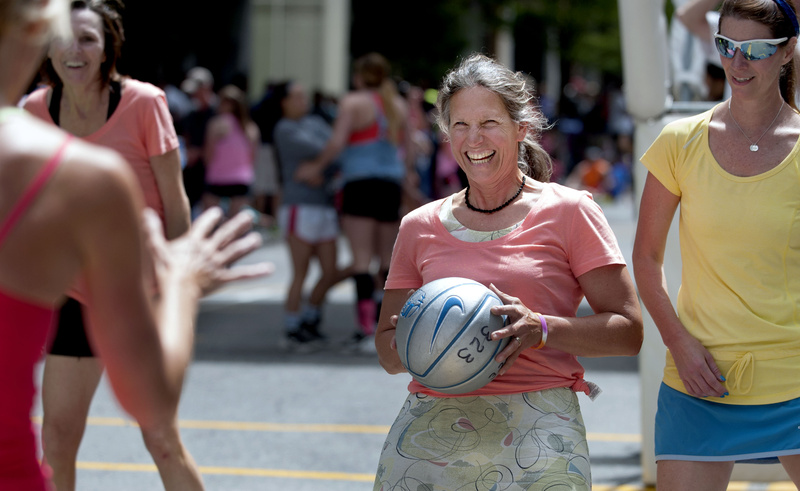 Year by year, Hoopfest gained support from spectators and from downtown businesses. That success wasn’t a slam dunk, he said. Kelly, now an attorney at Spokane firm Lee & Hayes, notes two reasons why Hoopfest became the largest outdoor basketball event of its kind in the world. First, it modeled itself after the Bloomsday run by assembling a dedicated core of staff organizers to recruit a diverse group of loyal community volunteers. Kelly noted that both of the city’s big sporting events owe their growth largely to being organic local efforts. Hoopfest’s success didn’t rely on a chamber of commerce or public officials making it a pet cause or fundraising endeavor. Second, Hoopfest organizers did not justify the event as a moneymaker for area businesses. The economic spinoff became a byproduct of its bigger goal, that of making Hoopfest a fun event, Kelly said. During the first five Hoopfests, as organizers added more music and more park-focused entertainment to the mix, there was still some grumbling. Chief among them were some Spokane businesses concerned that the huge crowds choked downtown’s streets for a full weekend and kept customers from getting to their stores. Downtown retailers, including Nordstrom and Auntie’s Books, told Hoopfest organizers they liked the idea of Hoopfest, but they hoped ways could be found to give their customers easier access. Rick Steltenpohl, who became the first executive director of Hoopfest about 22 years ago, saw a problem. “We can’t change the fact that we were putting hoops and baskets out front of a lot of businesses,” he said. An accountant by training, Steltenpohl first thought it would become obvious to Hoopfest doubters that the event was a win for everyone. After a couple of years, he learned that some of the unhappy businesses had raised valid concerns. While Hoopfest proved a boon to hotels, restaurants, sports apparel stores and bars, many downtown retailers didn’t reap the same benefits. Instead of being filled with shoppers, many businesses were busy with players and spectators marching inside to use restrooms without opening their wallets. “It didn’t hit us back then that other businesses could be impacted negatively by closing access to the streets,” Steltenpohl said. In time, Seattle-based retailer Nordstrom began adding sports-themed displays and product tables geared to basketball. And now the staff wear Hoopfest-themed shirts and hoodies to add to the weekend’s celebratory spirit, Nordstrom spokeswoman Emily Romans said. Chris O’Harra, owner of Auntie’s, said she’s learned to relax and accept that her store will net only 60 percent of normal summer weekend sales. Many other downtown businesses have adapted by deciding to close for the weekend. Patty Pettigrew, owner of Spokane Exercise Equipment, tried to have normal weekends in the first several years of Hoopfest. After five years she and her husband, Gary Pettigrew, realized Hoopfest doesn’t bring their type of customer downtown. Now they shut down their store during Hoopfest and enjoy the days off. Another business owner, Murray Huppin, said he soon understood that the overall value of Hoopfest outweighed the negative impact on Huppin’s, his family’s longtime downtown electronics business. Until last year, the store was near one of Hoopfest’s most congested court areas along West Main Avenue and near the former parking lot where a new convention center hotel is now under construction. By the third Hoopfest weekend, Huppin began to close the store on Sundays. Like Pettigrew, he realized his regular customers wouldn’t come downtown that day. After moving to its new location outside downtown, Huppin said the company is more involved in Hoopfest than ever. It’s sponsoring a block of courts along Spokane Falls Boulevard and is co-sponsoring a Beats Lounge near Center Court, featuring displays of Beats audio equipment. “If you can’t get caught up in the spirit and excitement of Hoopfest, you’re missing one of the key reasons why Spokane is great,” Huppin said.